Last weekend my 6 year old and I completed this color by numbers picture together. After we finished coloring the last couple of spaces, we celebrated with a high five and a good hug. And we talked. We talked about what a struggle it had been at the outset. He shed a lot of tears at the beginning because he was having trouble staying inside the lines. It frustrated him beyond belief that a stray stroke of red had infiltrated a space dedicated solely for yellow. In fact, for a period it paralyzed him. He would not continue. He insisted that I do it instead. He cried some more. He walked away. Later in the day he came back to it. He experimented with using an eraser. Within moments he was back in the game. And this time I offered to join him. 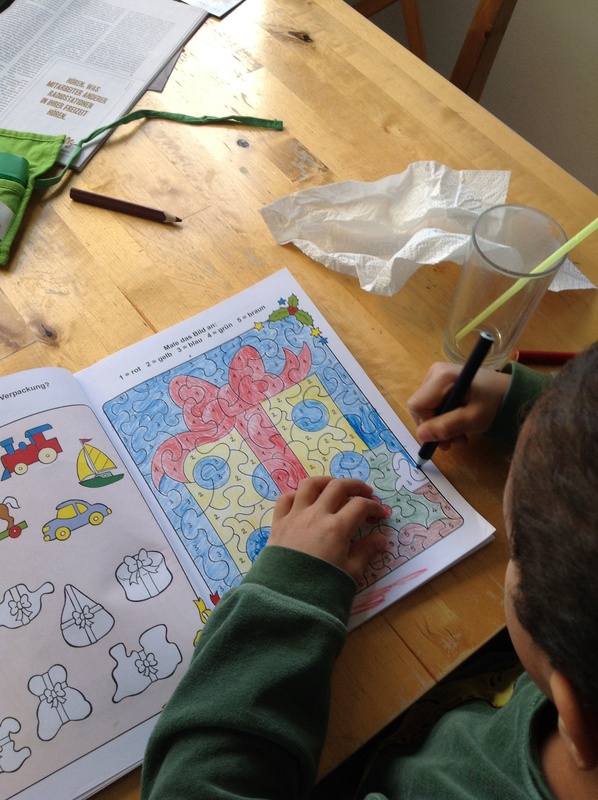 He assigned me to color in the blue spaces while he took care of red. What a transformation! For both of us! I got off my “You’re a big boy, you can do this on your own” trip and sat down and found my own challenges trying to stay inside the lines. He saw that my work was not perfect and said, “That’s OK, Mom.” This side-by-side, shared coloring space became a brief but profound oasis of calm – a much needed respite from our previously charged back and forth. The incident raised some questions in my mind. What makes perfection so compelling a goal? What are the risks of going outside the lines by accident? What about doing it on purpose? What’s the reward for sticking to the rules and coloring inside the lines? Our reward was the satisfaction of seeing the big picture that was revealed after coloring all those individual spaces. We also experienced the joy of having overcome a struggle to arrive at this result. I realize that I have a tendency to advocate for an “outside the lines” approach to many topics and this time I see that resisting that default setting actually helped me build a bridge to my son’s initial space of disappointment and inadequacy. By sticking to the task and the rules, cooperating and celebrating we created a far richer piece of family artwork.